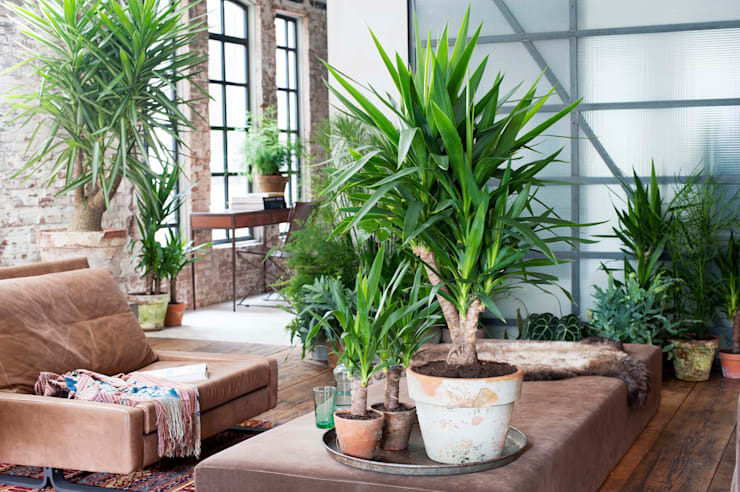 Indoor plants are an important part of a home, particularly if you are an apartment dweller in a big, busy city. They are your substitute garden, link to nature and infuse your home life with some much-needed serenity. But almost every home gardener is guilty of getting a little lazy and plonking ordinary old pots on the window ledge. 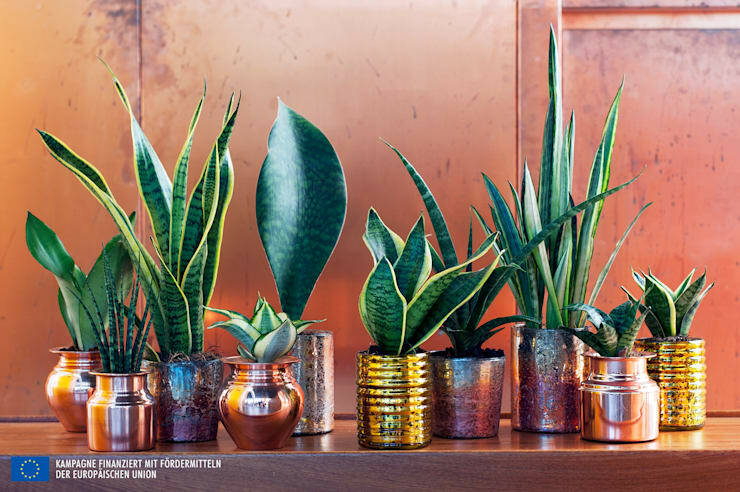 This is a shame, because houseplants have organic lines and lovely colours that can be incorporated into your design. They can often be used to decorate vertical space, and this is very important if you have a small apartment. 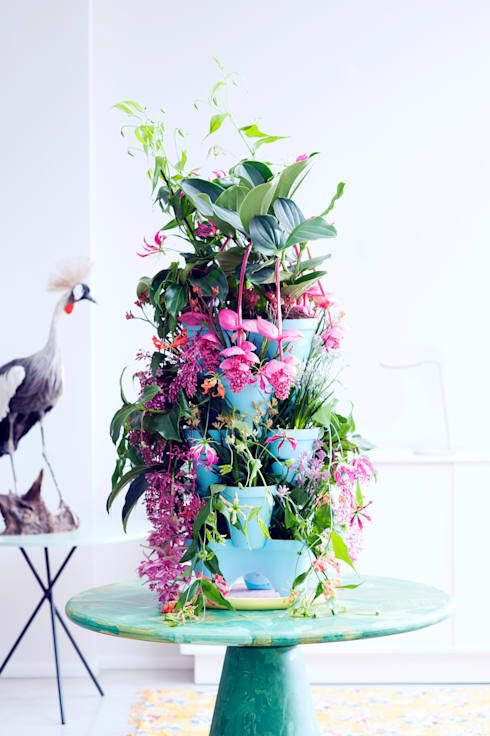 So, here at homify, we have gathered a great collection of indoor plant displays. 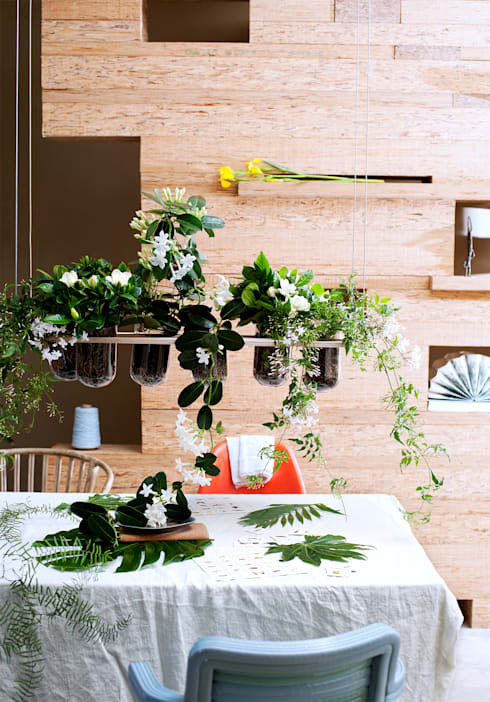 Without further ado, here are 12 creative ways to display indoor plants. Enjoy! Ditch the white walls and consider something with a little more pizzazz. We love the geometric pattern in this example. It adds that extra splash of life to this lovely display of wall plants. Note how the yellow pops right out to create a dazzling contrast of colours. 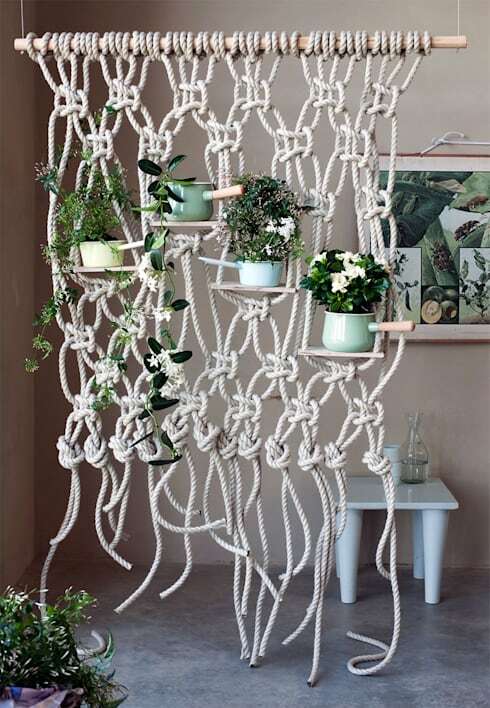 This hanging rope wall is a contemporary take on the old macramé walls that were popular in the 1960s and 70s. It falls beautifully from a suspended rope and could fit in almost any living space. It's a great DIY project as well. 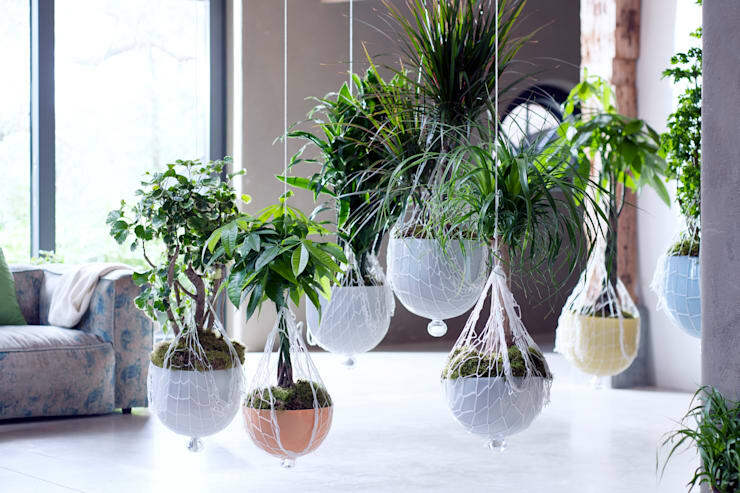 These hanging pots from Pflanzenfreude are suspended from the ceiling with fine, white hanging nets. They are a nice graceful alternative to the rather heavy hanging products more commonly on the market. They also suit that bright, light and contemporary look that is so popular in modern, minimalist interiors. This rather unusual indoor plant display is so beautiful and unique that we're surprised we haven't seen this kind of design more often. The pots have been piled up rather like a tiered wedding cake and result is nothing short of spectacular. Now, we are fans of the translucent beauty of a terrarium as much as the next person. 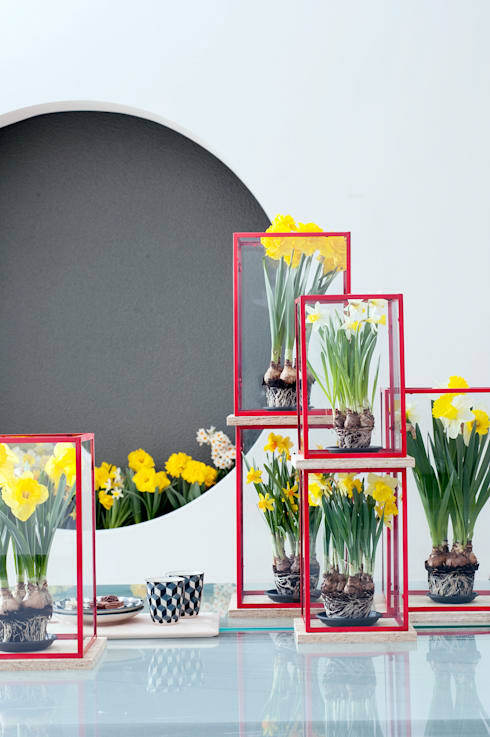 But the red frames of these glass boxes have us rethinking our whole approach to terrariums! They are modern, elegant and this collection is perfect for those who love geometry patterns. 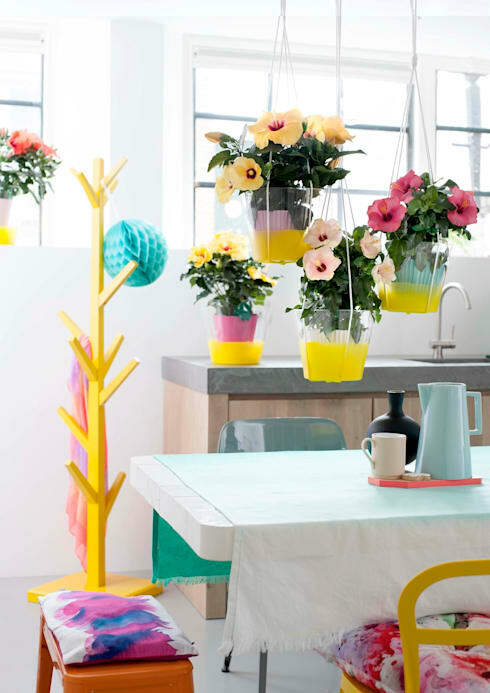 These transparent yellow hanging pots add a great splash of colour to this bright kitchen. We love how the bright yellow is continued in the furniture throughout the room. Pflanzen mit weißen Blüten als frisches Hängeelement. These days many of us have combined living areas and it has become increasingly popular to create hanging features over the dining area. These help create a zone around the dining area and can be another spot for your plants. Just check out this awesome hanging plant feature! 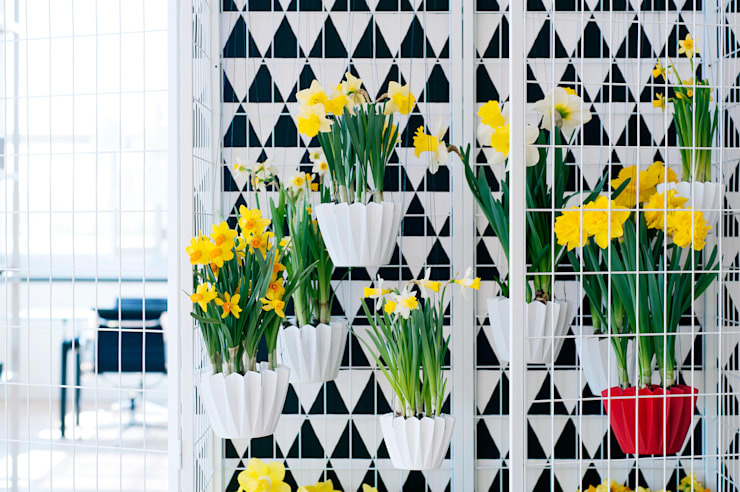 Don't just scatter a few plants around the room, collect them in one spot and create a display wall. Here we have a lovely collection of pink, purple and blue pots. Each contains a succulent that builds on the existing theme. Look at a colour wheel and work with colour. Here we can see how brass pots blend into the background and provide just the right amount of contrast to make the green leaves here pop. 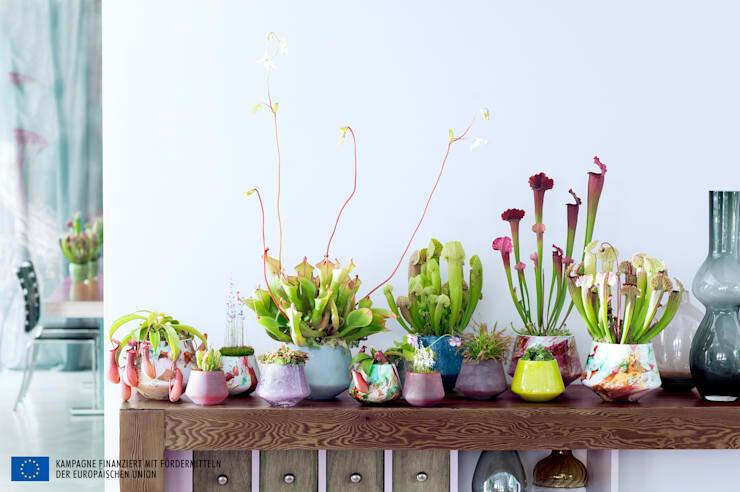 No article on ways to display plants is complete without a terrarium or two! 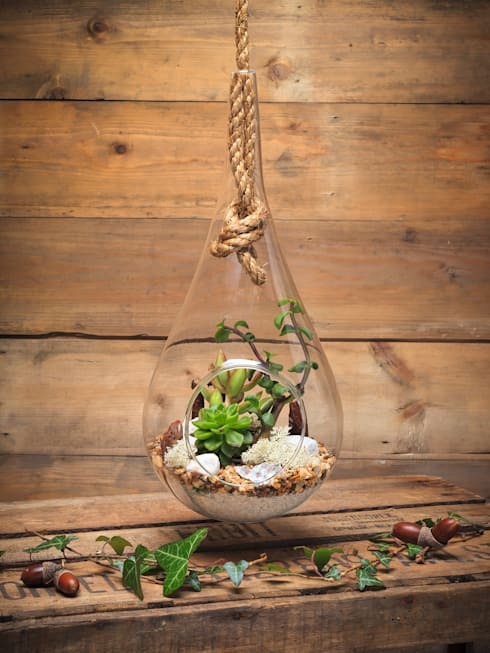 Here we have a lovely teardrop glass bulb with a beautiful little terrarium. These can be installed anywhere without direct sunlight and they are one of the most low-maintenance indoor gardens around. 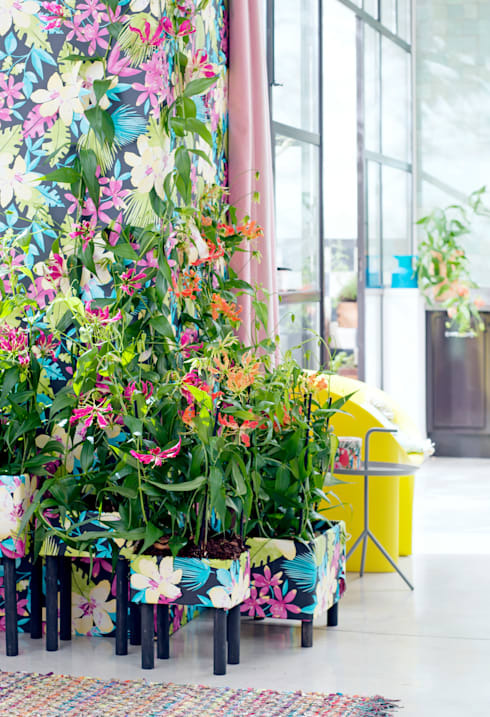 Extend the reach of your plants with some wild floral prints. Note how the fabulous floral print of the wall and the pots blends beautifully with the natural bloom of the houseplants. It is extraordinarily busy, but we love it! Many people are reluctant to get adventurous with their indoor plant displays because they're afraid of losing access for watering routines. If you are one of these people, look into creating a low-maintenance collection plate. If you are interested in introducing a little more serenity to your life, you'll love 9 simple ways to live more mindfully at home. What do you think of the indoor plant displays we have covered today? Do you have any additional tips? Let us know below!